Ada 2005 support is available in the System Engineering and Ultimate editions of Enterprise Architect. Enterprise Architect supports round trip engineering of Ada 2005, where the following conventions are used. A package specification in Ada 2005 without a tagged record. A procedure specification in Ada 2005. A type definition, subtype definition, access type definition, renaming. Determination of whether the parameter is an access variable. 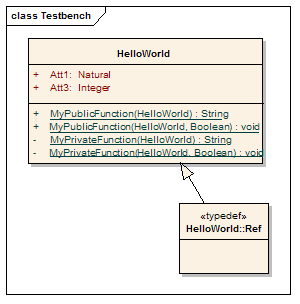 The instantiated unit's type (Package / Procedure / Function). The part type (renames or new). If Value = SubType, set subtype. If Value = Access, set access type. Appropriate type of source files: Ada specification file, .ads. Ada 2005 imports packages defined as either <<adaPackage>>Class or Class, based on the settings in the Ada 2005 options. A package in the Ada specification file is imported as a Class if it contains a Tagged Record, the name of which is governed by the options Use Class Name for Tagged Record and Alternate Tagged Record Name. All attributes defined in that Tagged Record are absorbed as the Class's attributes. A procedure / function in an Ada specification file is considered as the Class's member function if its first parameter satisfies the conditions specified in the options Ref Param Style, Ignore Reference parameter name and Ref parameter name. The option Define Reference for Tagged Record, if enabled, creates a reference type for the Class, the name of which is determined by the option Reference Type Name.